Here is the best solution to convert DVD to SBS 3D MP4 for enjoying the 3D video with the assistant of the 3D DVD Ripper. Maybe most 3D movie fans would ask the same question to either backup their 3D movies free from physical disks or prepare for future usage such as watching copied 3D movies on 3D player. But how to get them playable on these 3D device and if doing converting, is it will surely leaded to the loss of 3D effect? "I'm trying to find out if I can rip my 3D DVD's to my HDD and still get 3D playback on them to my TV via my HDMI connection. If so, how exactly would I go about burning them (if there is a certain way), and is there any special software or anything I'll need to play the DVD's back through to do this? I am using Mac OS X 10.9 Mavericks." 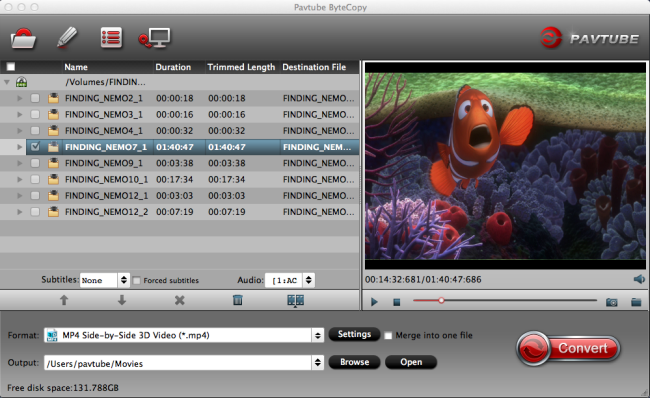 To rip DVD to side-by-side 3D MP4 video, Pavtube ByteCopy for Mac is the best 3D/2D DVD to Side-by-Side ripper to assist you with ripping Blu-ray and DVD to side-by-side 3D MP4 format. It can also output the format with multiple audio tracks and subtitles preserving. Windows users could use ByteCopy which is specially designed for Windows users to create 3D SBS MP4 video out of 3D/2D Blu-ray/DVD movies. 1. Add 3D DVD source file to the program. Download and install the latest Mac 3D DVD Ripper onto your computer. Launch it and click "Add Video" icon to load 3D DVD files. Click "Format" bar and move mouse to "3D Video" column, you can choose "MP4 Side-by-Side 3D Video (*.mp4)" as output format. 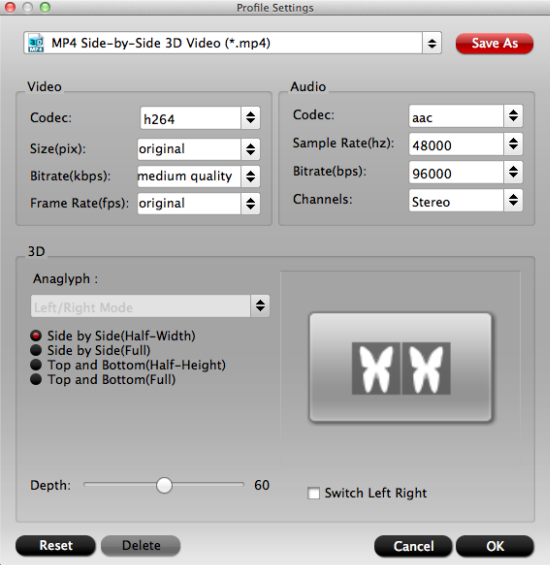 If you want to output Anaglyph 3D or Top-Bottom 3D, you could choose it according to your specific need. Tip: You can adjust target video settings and 3D effect. When everything is OK, just press the "Convert" button to start the conversion. It will not take much time. Just wait for the conversion process to get done. 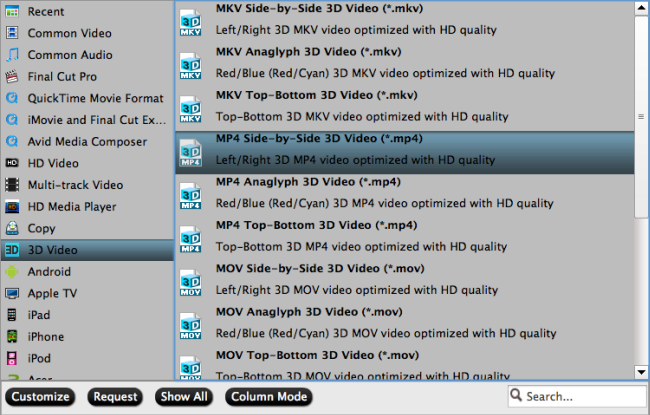 Once the conversion finished, you are able to get 3D MP4/MKV/MOV files via clicking "Open" button. 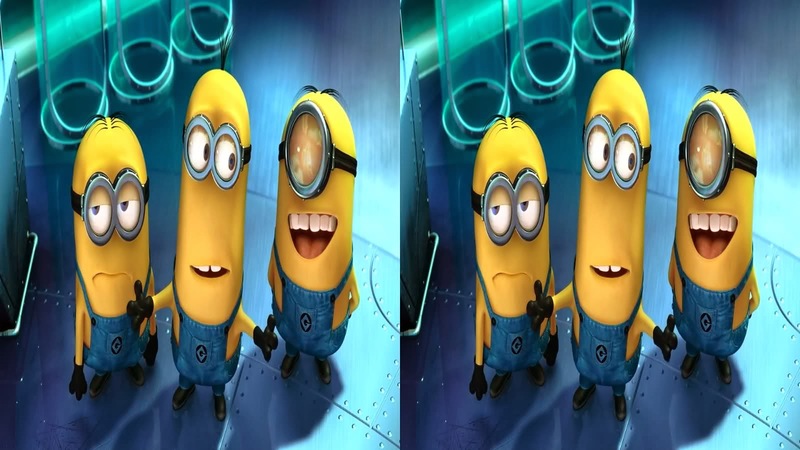 The image below is the Side-by-Side effect when viewing without putting on glass. When play the 3D MP4 on your TV, You may find it comes up in two screen, just hit the 3D button on your TV, and it will pop up a window saying put on your glasses, choose "OK". Another window appears showing your 3D choice: Side-by-Side. Put on your 3D glasses, and then just enjoy 3D Movies!